Built like a tank -- the biggest, toughest and most durable cart on the market. Thermoplastic trucks have 8" solid rubber, semi-pneumatic tires (2 w/brake) and steel trunk has air-filled pneumatic tires (2 w/brake). 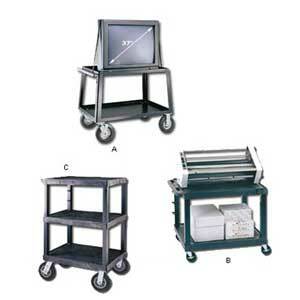 A) HW32TE8...made of arc-welded all steel construction with 1/4" safety retaining lip on all shelves. Features a powerful 3 outlet electrical. Black powder coat finish. Ships truck. B) WTVJ32E8...constructed of injection-molded thermoplastic that won't chip, wrap, crack rust or peel. Features 2 steel bars molded into top shelf for extra strength. Features a powerful 3 outlet electrical. Rolls on 8" solid rubber semi-pneumatic tires, 2 w/brake. Black in color. Ships UPS. C) WTV44E8...constructed of injection-molded thermoplastic that won't chip, wrap, crack rust or peel. Features 2 steel bars molded into top shelf for extra strength. Features a powerful 3 outlet electrical. Available in Black or Gray -- please specify. Ships UPS. Product No. Ltr. No. Size H x W x D No. Shelves Electrical Wt. (lbs.) Price Ea.